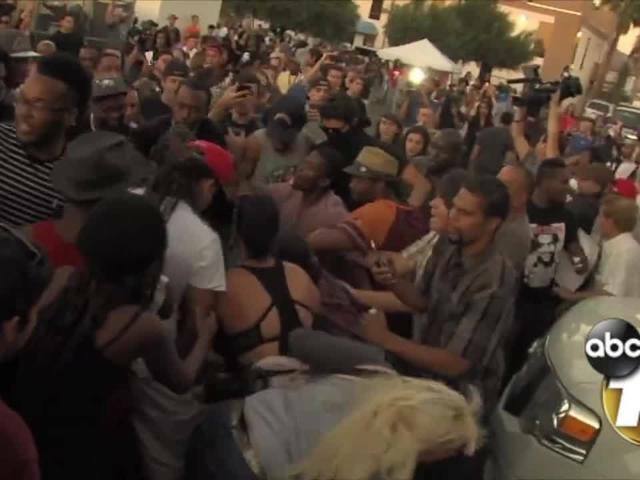 EL CAJON, CALIF. - Unrest continues in East County after the shooting death of Alfred Olongo at the hands of a police officer. Wednesday, at the site of the shooting, a man wearing a red hat with the Trump slogan, "Make America Great Again" was spotted by protestors who chased him through the Broadway Village shopping center parking lot. There's no word yet on if was injured in the scuffle but, as you can see in the footage, he did manage to make it to police officers nearby and avoid further confrontation. The protests started early Wednesday morning at the El Cajon Police headquarters on Civic Center Way. A few hours later, just after 11:30 a.m., the large group began an impromptu march to the scene of the shooting on Broadway. 10News is still live in El Cajon, where the group seems to only be growing. This is an an ongoing situation, we'll continue to update as the story develops.